I picked this one up because I greatly enjoyed Jemisin's Hundred Thousand Kingdoms, but this novel was even better. Jemisin blew me away with her world-building and beautiful writing. It's the tale of an alternate earth called the Stillness, which is plagued by constant seismic activity. This leads to frequent near-extinction events called "Fifth Seasons" that keep humans on their toes. The evidence of past civilizations litters the planet -- ruined cities, incomplete 'stonelore' handed down from earlier generations, and strange obelisks that float through the atmosphere like low-altitude satellites and serve no apparent purpose. The civilization that we meet in this book, the Sanze Empire, has survived for centuries by harnessing the power of orogenes -- people born with an innate ability to control their environment. The orogenes can stop earthquakes or start them. They can save cities, or drawn power from living creatures and "ice" them. Their powers are terrifying yet essential, so the empire develops a caste of Guardians who have the power to neutralize the orogenes when necessary. The orogenes are held in contempt and called "roggas" by ordinary humans. Despite all their power, they cannot control their own lives. They are either hunted down and destroyed or sent to the Fulcrum to be trained and used by the empire. Imagine Hogwarts, if Hogwarts treated its students like chattel. 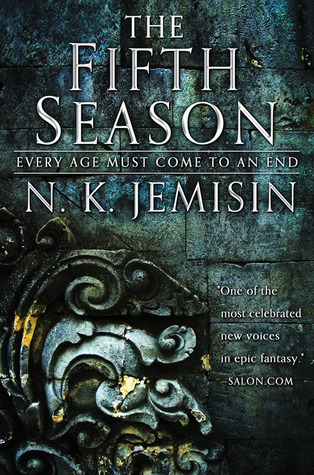 The world Jemisin creates is as horrific as it is brilliant. My advice is to give the book at least fifty pages before passing judgment, because it takes a while to understand what is going on. There is a lot of terminology to get used to, and the book is told in three intertwining narratives that at first don't seem to match up, but once you get into the world and into the story, it is a fantastically rewarding read. I can't say much about the plot without giving away some of the wonderful surprises, but if you want to read about a truly dystopian world that holds a mirror to the darkest of human motivations, this novel will haunt you long after you finish it. Thank you for everything, including this amazing review! I'm really glad you reviewed this, especially the hand in there, it all comes together part. I don't usually read others reviews before I start a book because I don't want my mind to be contaminated with their opinions. Glad I bent my rule. Starting now! Your review is what influenced me to read this book. Thank you for your wonderful review. I just finished and im in shock. wow. what a book! Thank you for your review - very helpful. having now read The Fifth Season I would have to say Rick that I dont think it is an alternate earth. I think Jemisin is writing about the future we are currently bringing about! Hey I picked this book up because I have heard great things about the author and her novels. But this is the first book I have picked up. Would this be a good start? Or should I have started with one of jemisins other story lines, I'm not sure how or if they are connected somehow? I want your opinion this books contains a good story or a bad story ? I couldn't agree more about how beautifully written this book, and in fact the entire trilogy, was. Such sensitivity. I almost gave up... after around 80 pages it started to get some sense... lets see how it goes. Your review helped me understand the book so much better. I should have read your review first! It's insane how right you are. I am certainly going to have to pick up the next book, in about a month, while I savour this book.